Ever since I discovered Marfa, Texas almost two years ago, I’d been dying to visit it. About once a month I’d get an itch to finally go, make an announcement to everyone that I’m going, am reminded that it’s an eight hour trek from Austin to Marfa, still announce that I’m going, wake up the next morning thinking about driving in a car for eight hours only to drive back the next day for another eight hours, and go back to sleep. Finally after two years of this repetitive behavior, I finally made it to my beloved Marfa. 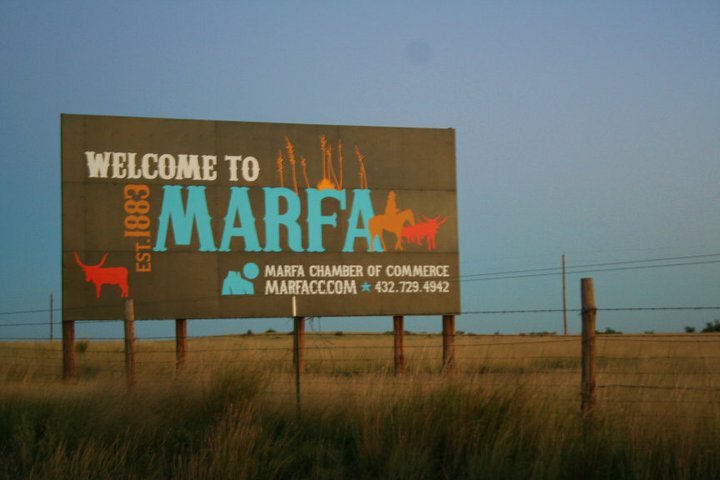 If you live in Austin, Texas, you know what Marfa is. It’s kind of like the Palm Springs to Los Angeles or the Coney Island to New York City. Actually it’s none of those places at all. If you live outside of Texas, you may have heard of Marfa because of the famous films shot there, Prada Marfa, The Chinati Foundation, The Marfa Film Festival, or The Marfa Mystery Lights. Maybe you’ve never heard of it at all. 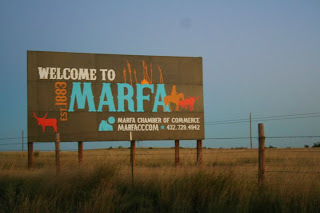 Marfa, Texas was founded in 1883. A lowly railroad stop before then, the wife of the president of Southern Pacific Railroad reportedly christened the stop after a character in a Dostoyevsky novel, most likely The Brother Karamazov, though this gentleman doubts that probability. Marfa thrived through the years as a ranching and farming town, as well as a military training camp during the Mexican Revolution and World War II. As ranching began to wain during the 20th century, the town’s economy shifted focus after the introduction of Donald Judd to the area. Judd, a well known minimalist in New York City, relocated to Marfa in the early 70’s and legitimized the place as a playground for artists. Today, Marfa has both The Chinati and Judd Foundations– in addition to multiple art galleries- and continues to be an escape for creative types and out-of-the-box thinkers. This small town also has been a popular area for film making. The Rock Hudson-Elizabeth Taylor-James Dean film about Texas oil and cattle, Giant, took over the town, shooting for two months in various locations around Marfa in 1955. The still standing El Paisano Hotel was used as the cast and crew headquarters. Today, the hotel continues the Giant legacy with an informal museum and restaurant named Jett’s Grill. Recently both There Will Be Blood and No Country For Old Men were shot in Marfa. What Marfa has been known for maybe the longest is their mystery lights. First reported in 1883, mysterious lights have been appearing on the horizon located roughly nine miles west of town. There is no rhyme or reason to when the lights appear or how they behave- doing everything from changing colors, changing brightness, moving, and disappearing all together. Theories as to what they are range from UFOs, car lights in the distance, Native American ghosts, and swamp gas. To this day the lights have not been explained and only disappear when you get close to them. We rolled into Marfa at the perfect time. Little did I know that I was thinking that at the time. I have a habit of being nostalgic for places at the time I’m experiencing them. Wishing I was alone or with someone I’m hopelessly in love with. When in fact, the circumstances and the person I am with at the time couldn’t be anymore perfect. This thought will continue to haunt me the next morning when I wake up in a king size bed in a room built in 1930 overlooking the whitewashed store fronts of a bygone era and listening to the repetitious melody of metal hitting metal on the train track below. The truth is, no matter who you are driving with on the way to Marfa, you are completely alone. You and the road. You and the Big Sky. You and the West Texas horizon. You will get out of the car to look at one of the few speckles of color that dot the landscape- double makeshift white crosses covered in plastic flowers and magic marker scrawl- and realize that you can’t hear a thing. The only reprieve from the rotating desert backdrop comes in the form of a lone building standing on the west side of the road. A building 15 by 25 feet and showcasing high heels and handbags to no one at all. The Prada logo shines boldly from the canopies and you peak in to see only spiders and flies active in the place. This installation art piece was built in 2005 and will one day slowly erode back into the landscape. Though flicked with the fingers of worldliness, Marfa is still a small town. Upon arriving you are welcomed by a Dairy Queen and the familiar run-down houses you’ve been seeing scattered across West Texas. There are four hotels and a four block stretch of main street. There are 2121 people and they all have an opinion about their town. “Where are you from? !” A slightly pained-looking middle-aged man said as we we snapped pictures under the Marfa hacienda arch. “New York” my mother said. The man proceeded to tell us how specifically Austinites and New Yorkers have been pillaging his cherished town for years- moving in, setting up shop, never contributing to the economy, and only sending money back to where they came from. He specifically pointed out establishments we should not stay, eat, or shop at- places not owned by life-long residents- and with a gruff, got into his truck and drove away. I had difficulty understanding his resentment. My understanding is that the New Yorkers (Donald Judd et al.) and the Austinites (various business owners who own hotels, restaurants, and galleries) have only helped to make this town more than just one of the many forgotten West Texas blips on the map. However, not every resident felt that way. We ran into the unofficial ambassador of Marfa. A friendly gentleman by the name of Ken who walked with us off and on along our journey through town, occasionally losing him as he stopped to say hello to every single person that came across his path. He was not native, but had lived there for twelve years and didn’t feel so strongly against the big city people that come to play and gawk in cattle and oil country. As Ken was telling us about his book of poetry that sells at the only bookstore in Marfa, I spotted three characters walking from the most expensive restaurant in town. A place where one plate will get you three at Carmen’s around the block. They were dressed all in black. The gentleman wearing a turtleneck and oval-shaped wireless glasses. The ladies wearing combination slick leather heels, shirred skirts, and scarves draped over their billowy tunics. I thought of the movie, Beetlejuice- the artsy nouveau riche family from New York City who moved out into the country and contemporized their farmhouse and threw sushi parties- and for a second, I understood what the angry resident was conveying to us earlier. I then caught my own reflection in a storefront. An entire ensemble from American Apparel- asphalt high waist pants, black and creme striped bodysuit, rusty floppy hat- all topped off with unlaced vintage leather boots and some bright red lipstick. Maybe I’m one of them too- but won’t you just let us pretend for a second that we’re someone else? Won’t you let me walk in my daydream for awhile? I love old towns like that, too (I really want to go to Tombstone one day). Marfa sounds like a mystery, but a lot of fun. Did you do any ghost explorations while you were there? Every town has its own charm and stories to tell. Thanks for sharing this with us. the post i've been waiting for…thank you!! @Tsaritsa- Is Tombstone in Arizona? @Just Plain Tired- Yes, even the littest towns have their stories. Even my po'dunk town in Upstate NY. I feel like i've just been through Marfa, you captured it perfectly. Bet there's no organized crime in the town. No crim could get respect saying he was godfather of the Marfa Marfia. One of our all-time favorite places in the world! Would you believe we met some fabulous people in Marfa who said they love Austinites and encouraged us to consider moving there? True story. 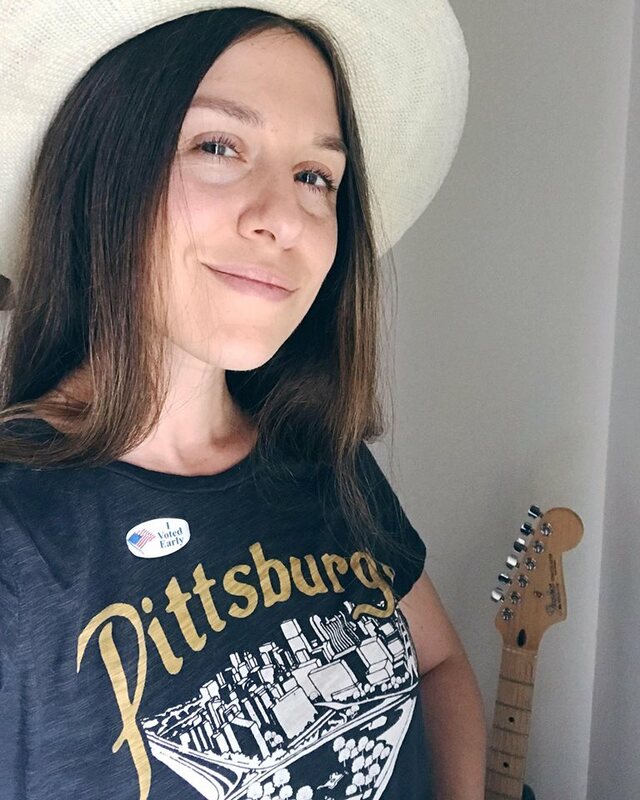 Makes me think about how Austinites are split between those who love others coming to our lovely city, and those who hate anyone who's moved here in the last ten years. Wow, looks absolutely beautiful, I love that installation. Yes, Tombstone, Arizona. I wanna go to a bunch of these old ghost towns. I’ve read a lot about El Cosmico and it sounds awesome! I’m a fan of Hotel Paisano because it’s old-school. Rates are pretty cheap too!